Given the fact that some music fans are oblivious to what their favorite lyrics refer to, I thought I’d simply shed some light on the topic. Further research on the topic will be up to you. The Book of Revelation (from the New Testament) speaks of a book/scroll in God’s right hand which is sealed with seven seals. 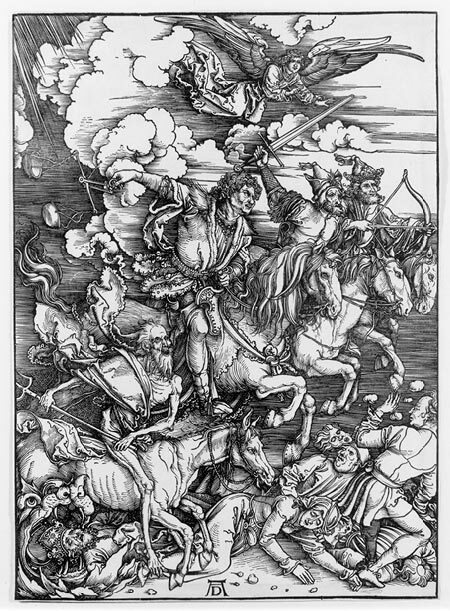 The four section titles from the quoted lyrics above (Time, Famine, Pestilence and Death) refer to the names of “The Four Horsemen Of The Apocalypse” (except Time is originally called War – possibly for rhyming purposes), who are released upon Mankind when the first four seals of the scroll are open. These beings are considered to be the harbingers of the Last Judgement. While Metallica isn’t a Christian Metal band by any means, they have always referenced religious topics that seemed to reflect their own beliefs. Their reference to “The Four Horsemen” came as a way to express their anger and frustration with humankind and their concept of justice and righteousness. Other references to this topic in popular culture are The Clash’s 1979 album “London Calling”, Judas Priest’s “Nostradamus”, DragonForce’s “Revelations” and Megadeth’s “Blessed Are The Dead” among others (more on The Four Horsemen of the Apocalypse in popular culture). I hope you enjoyed this overview, make sure you follow all the links in the text above for more information on this interesting topic in Metal’s subculture.